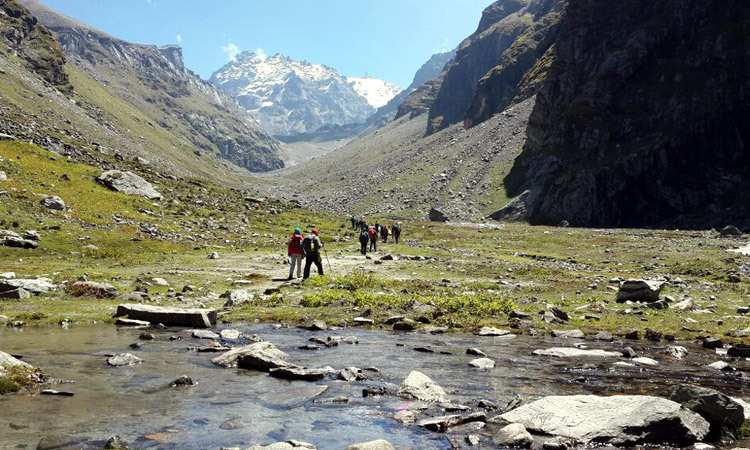 The Hampta Pass trek is undoubtedly one of the most stunning crossover treks of the Indian Himalayas. Starting from the lush green meadows and forests of the Kullu Valley, the trail gradually ventures into the rugged and barren landscape of the stunning Spiti Valley. 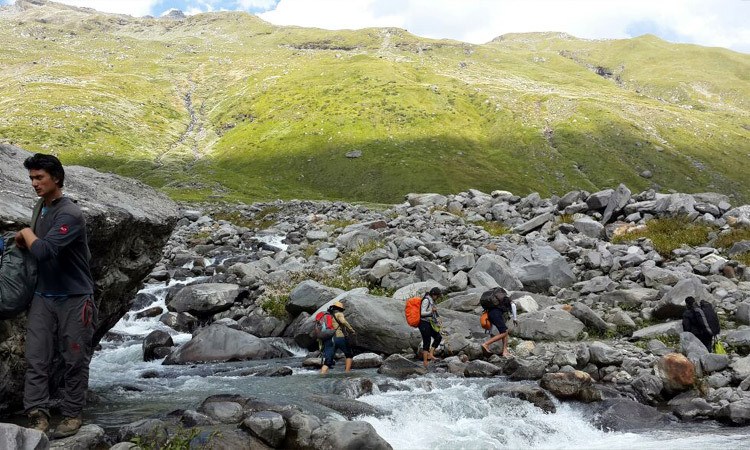 What a trekker is left with is a visual extravaganza and different shades of sublime shades of natural beauty. 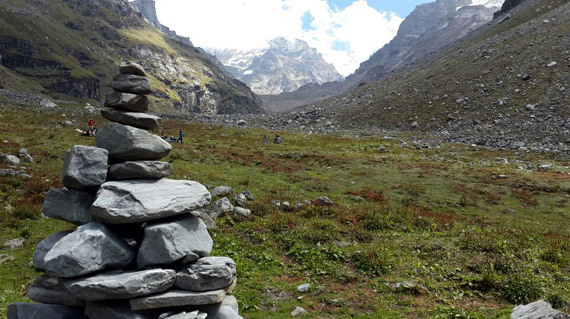 In fact, the Hampta Pass trek gives you a '2 in 1' kind of a feel where you experience two drastically different settings within a span of 4-5 days. It's when you come in the vicinity of the 14,000 ft Hampta Pass on the third morning, that the landscape changes from green to a mixture of grey an brown. 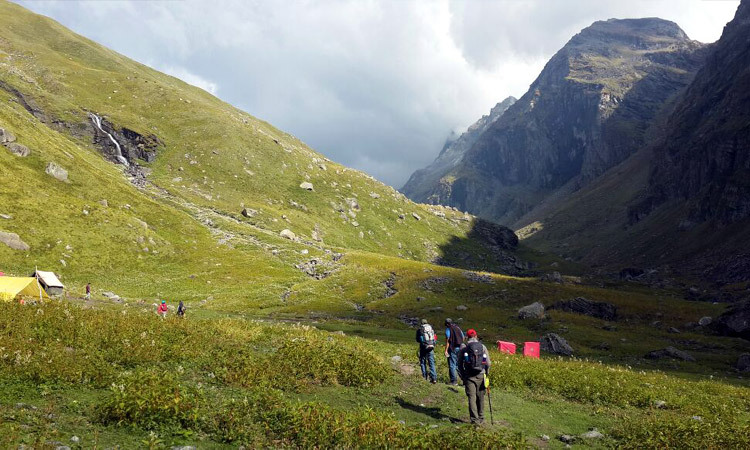 Spell bounding campsites, the ethereal Chandrataal Lake, a valley blooming with colorful shades, to a an arid poetry in motion..the Hampta Pass trek is a roller coaster ride, waiting to unleash a bag full of twist n turns at every new step. We assemble in morning in the heart of Manali, and undergo a round of getting to know each other. The trek leader introduces himself and the staff, and gives a brief of what lies ahead. Post this, you get on the veichles and drive to Jobra, the starting point of the trek. The 1.5 hours drive from Manali to Jobra takes you through 42 hairpin bends to the doorsteps of this stunnningly beautiful trek. You commence the trek by following a trail into the lush green Pine and Maple forest. 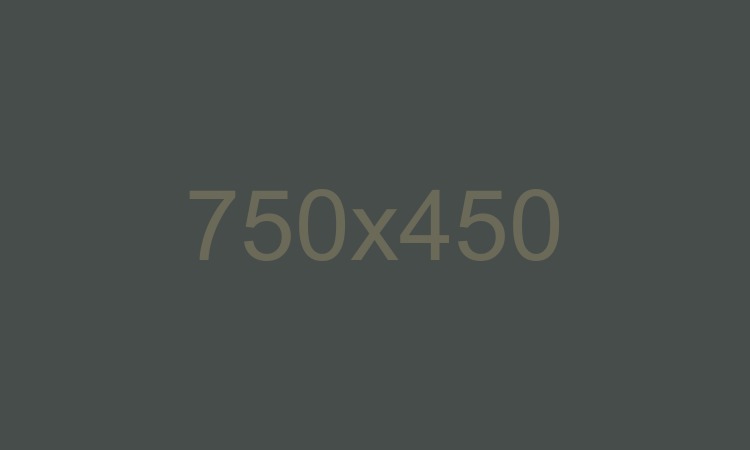 Once you cross the forest, you end being being in the middle of a vast lush green meadow. You will walk through this beautiful meadow for around an hour to reach a spot called Chika. The trail is easy and you have the Rani river to accompany you throughout the stretch. 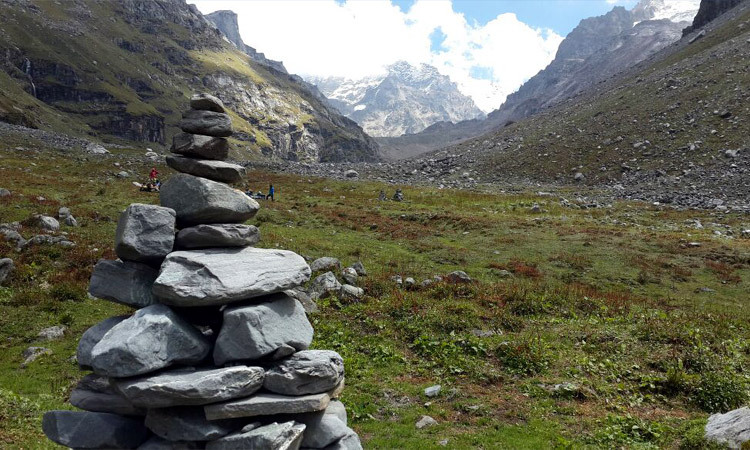 The trek further up from Chika is laden with stones and boulders. Jwara falls on the right side across the river. The region can be identified with waterfalls at some distance, and birch trees at the upper side of the mountains. As you go a bit further, you will come across a waterfall on your left. You will be crossing the river at this stretch. The water will be icy cold. Once you cross the river, you will be at the gorgeous Jwara Valley. Walking on the green grass carpet sprinkled with colorful varieties of exotic flowers is an experience in itself. The camp is set up in the meadow with the river gushing below. Today will be a moderate trek with a marginal and gradual incline throughout the stretch. You start walking along the Rani river. Gradually the trees are left behind, and all that remains is huge grass fields and an amazing view all around. Leaving Jwara behind, you will find the terrain flattening, as you reach Chota Balu ka Ghera. A perfect spot to just loosen up and have a quick snack. The trail from this point gets rocky. Things get a bit tricky, as you need to jump across the scattered boulders. 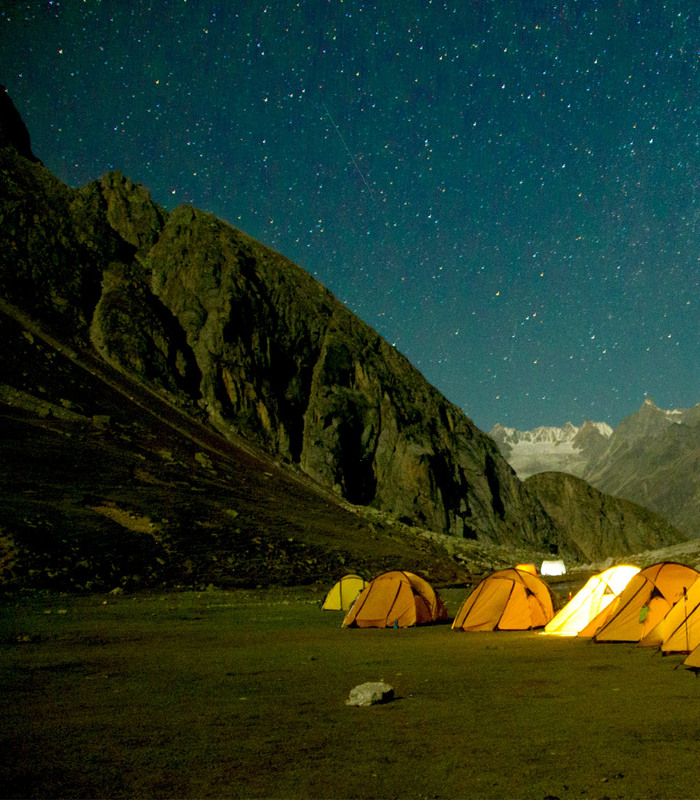 An adventurous trek of close to two hours finally brings you to the mesmerizing campsite of Balu ka Ghera. 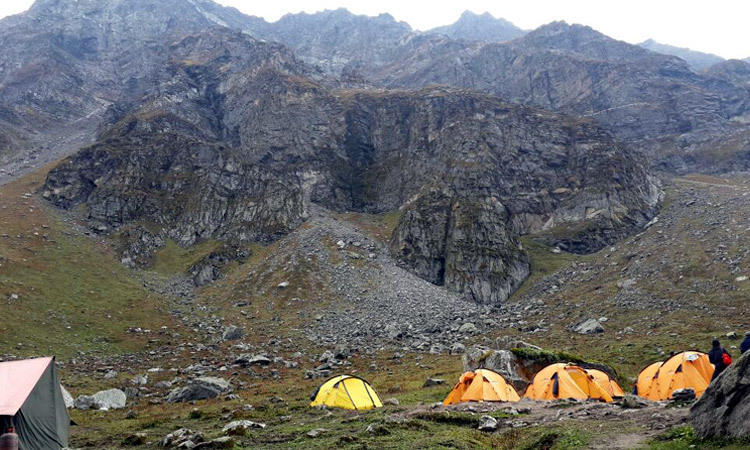 We pitch our tents at a beautiful site next to the river in the lap of the towering Bandarpunch peak. You will be able to see the mountains you need to traverse the next day to cross the Hampta Pass. It's the longest day of the trek ahead, so we start early. Today's day can be divided into two stages : A moderately steep ascent till the Hampta Pass, followed by a steep descent to Shea Ghoru. You move towards the mountains you were admiring since the last evening. The trail passes through rocky terrain, and after an hour of a gentle walk, it starts ascending. After about half an hour of demanding climb, you reach a small stop, and break for a well deserved rest. It is a great spot to view the majestic Deo Tibba peak right in front of you. About half an hour further from this point, you reach the top of a ridge. You will see another parallel ridge from here. Hampta pass is a bend away from the top of this ridge. It's a steep ascent from here on. You will take about half an hour to complete this vertical stretch and finally reach atop the Hampta Pass. Have lunch atop the Hampta Pass and marvel at the amazing views of the Indrasan and Deo Tibba peaks. Its very windy at the pass, and at this height there is always a chance of sudden rain or snow. The descent from the Pass is even trickier. It's a steep descent and you need to walk on slippery stones and soil. The best way to descend is by taking a zig zag route. You will be able to complete this stretch in half an hour. And now what lies in front of you is the vast and stunning landscape of the Lahaul Valley. The Shea Ghoru campsite is around a 90 minutes gradual descent from this point. 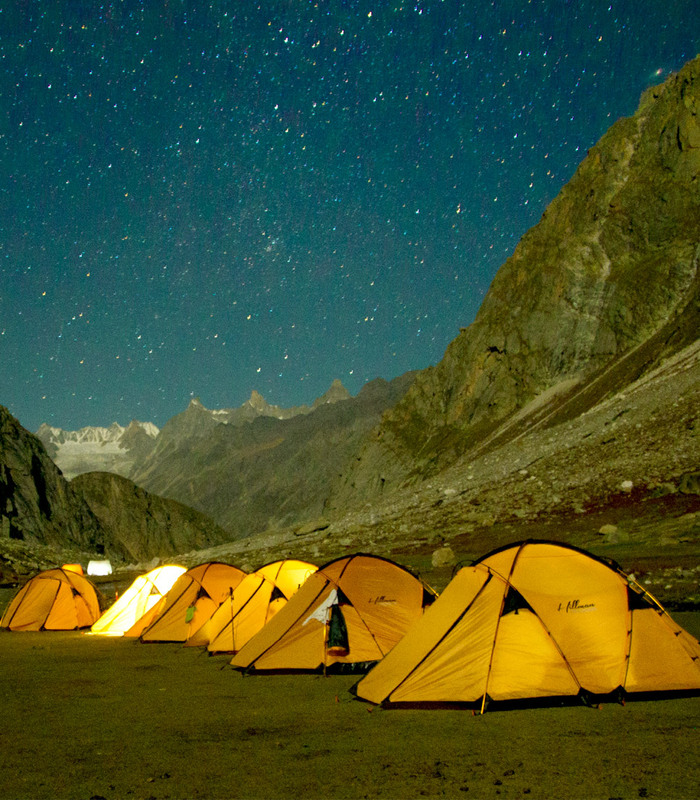 Shea Ghoru is one of the most beautiful campsites you can dream of. A green meadow, a nearby river stream bisecting the valley, with tall snow clad mountains surrounding you. It can't get any better than this. Day 4 Shea Ghoru to Chhatru (10,898 ft) ==> Drive to Chandrataal (14,100 ft) and return. It's a gentle to moderate descend all the way to Chhatru. You need to cross the icy waters of the Shia Ghoru Nala to move to the other side of the valley. 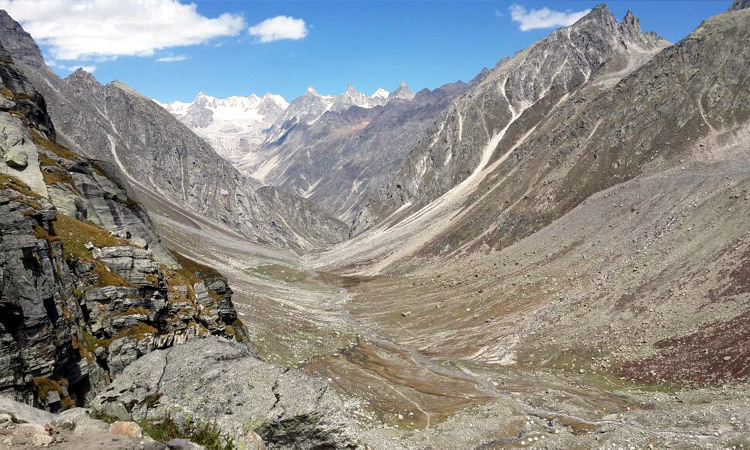 A further walk across the barren landscape of the Lahaul Valley, and you will get to see the Chattru road far away. The first sight of the moving veichles will be quite an experience after roaming around away from the civilization for the last few days. You need to trek further for about 3 hours to reach Chhatru from this point. When you finally reach down, you have the Chandra River separating you from the highway. We reach the Chhatru campsite by afternoon. 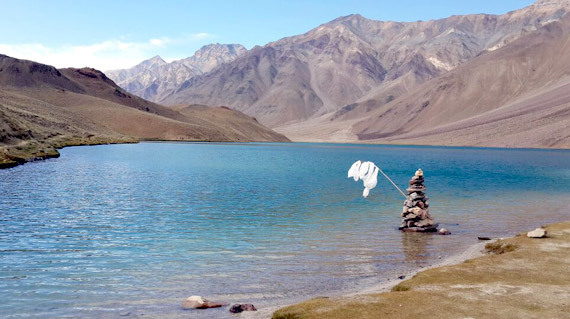 It�s advisable not to waste much time and start the drive to Chandrataal Lake as quickly as possible. The distance to the lake is around 70 kms, but since the road is not usually in the best of conditions, it may take around 3 hours to reach. Just one glimpse of the lake, and all your pains and dizziness are bound to dissapear. 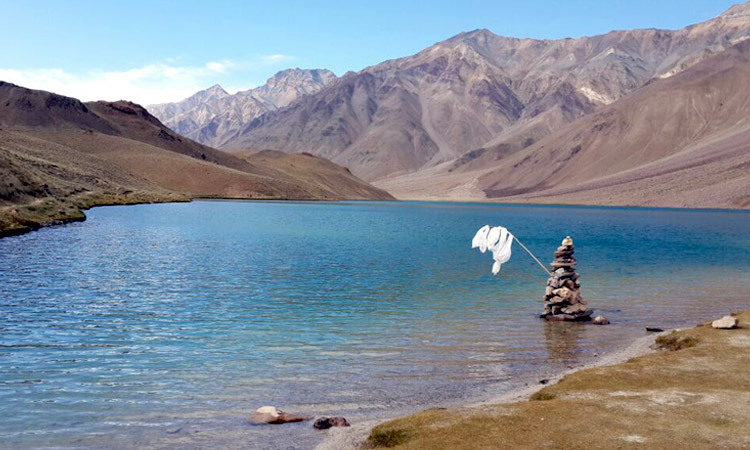 The beauty of the Chandrataal lake cannot be expressed in words. The serene waters have a calming effect on your body, mind and soul. A perfect place to put an end to the rigors of the past few days. 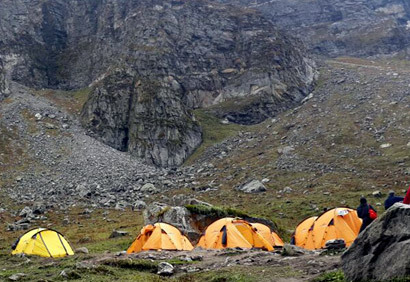 Spend some time exploring the heavenly surroundings and return to the Chhatru campsite. The drive from Chhtaru to Manali takes about 4 hours, and passes through Rohtang Pass. Its a wonderful drive and an awesome way to end this beautiful sojourn.